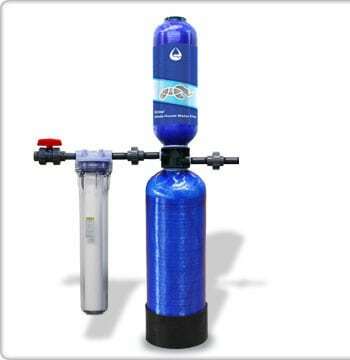 If you’ve been considering buying a whole house water filtration system you really should take closer a look at all of the benefits you and your family will receive from buying a whole house water filter for your home. Water, it’s essential to life. We can’t go for more than two or three days without drinking it. In fact our bodies contain a large amount of this precious substance. Around seventy percent actually. So having good, clean, healthy water is vital to your health. And having a system will give you exactly what a healthy body needs. Let me explain. Thankfully in today’s modern world we have safe potable drinking water that is convenient and readily available everywhere. In fact it’s the law that municipalities use strong disinfectants to keep their water supply safe for public consumption. With the introduction of chlorine, chloramines, and bromine we have H2O that is free of pathogenic diseases that were once a threat to human health. But with the introduction of these chemicals a new host of issues were introduced. When disinfecting chemicals like chlorine and bromine were introduced, new chemical substances were formed. These chemicals, called trihalomethanes, are created by a chemical reaction when the disinfectants and the decaying organic matter that are found in lakes, streams, and rivers combine. Organic matter like leaves, grass, lumber, and dead fish. Trihalomethanes are toxic chemicals and known carcinogens. On one hand several problems are solved with chlorine and the like. On the other hand serious problems are also created. There is a simple solution to these abundant and toxic chemicals. An almost miraculous substance called granular activated carbon works instantly when it comes in contact with toxic impurities. It is especially effective in removing the disinfecting chemicals like chlorine and bromine. It also removes hundreds of other toxic chemicals that EPA research has shown to be prevalent in many cities across the country. Now you’re probably wondering why you need to purchase a large unit that takes care of your entire home. Why not just buy a small counter top unit for your drinking water. That’s a good point we’re going to address. The largest organ on your body is your skin. It is very porous. Your skin absorbs substances very readily and easily. So when you bathe or take a shower your skin will absorb the chemical disinfectants. Not only that, some of the trihalomethanes are very volatile and will vaporize into the air for you to breath. A complete system connected to your homes main water supply will eliminate all of this from ever happening. for your home will give you and your family the strong sense of health and safety you deserve. Not only will you have water that tastes clean, pure, and refreshing, it will be much healthier for you too. All of the beverages you make with it like coffee, tea, and juice will taste far better also. Plus you will have the added benefits of softer skin and smoother hair when you bathe. Doesn’t buying a whole house water filtration system make sense today?